In the early 1990s, no one talked about transgender people, and no one knew one. We were not on TV or in movies. What formed the visible part of the transcommunity – overwhelmingly white, urban, and middle class – was also overwhelmingly focused on conferences, surgery or hormones and cisgender acceptance. This was still a determinedly non-political population, often in defensive crouch because it was also constantly under attack by the media, police, local legislatures, feminists and even LGB-but-never-T advocates. We were a group that still thought of ourselves as a collection of separate individuals, not a movement. What made political consciousness so difficult was that there was no "transgender section” of town, where we saw each other regularly. 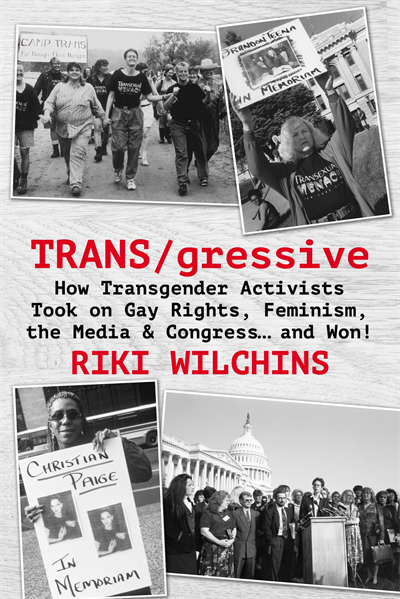 Add your review of "TRANS/gressive: How Transgender Activists Took on Gay Rights, Feminism, the Media & Congress... and Won!" in comments!